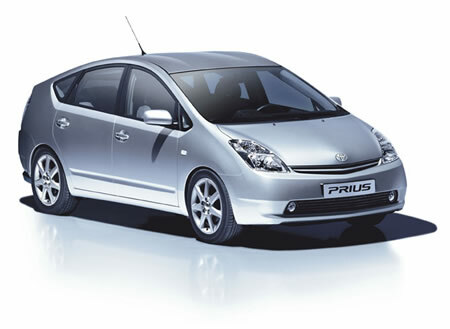 Reuters is reporting that Toyota is going to add solar panels, produced by Kyocera Corp, to the roof of their Prius Hybrid cars. The panels will be on the top of the line models, and will work toward powering the air conditioner. While it’s not powering the whole car, I do imagine that it could contribute quite a bit of power to the system as a whole. It’s the first time, that I know of, that solar panels have been commercially integrated into a production vehicle by the manufacturer. I’d love to see them add the ability to switch the power over to charging outlets for cell phones and other devices when the A/C isn’t in use, or to have it contribute to the main power cells. I’ve been on the look out for some reasonably priced solar panels that I could use to charge a device. I’d like to try taking a device like my phone or laptop completely off the grid, only charging it with solar power. If you know of any good solar units for something like that, I’d appreciate any help there. I’m excited about string ribbon wafer developments in solar. It could be very cool.